-- Scholastic never referenced each book's number in any location (spine, covers, inner list, etc.). -- The first documented mystery solved by Jupiter Jones occurred before The Three Investigators were officially formed. The mystery involved Mrs. Andrews' missing engagement ring and is described in the first few pages of #1 The Secret of Terror Castle. -- Because of the GLB Edition's stronger binding, their endpapers were attached in a different manner than the Trade Edition, and are nearly always found with the left and right sides of the graveyard/spiderweb illustration reversed. -- All Random House paperback titles printed in 1978 and 1979 did not have the book's number on the spine. For example, a First Printing of the First Paperback Edition of #11 The Mystery of the Talking Skull (printed in 1978) does not have a number on the spine, but the Eighth Printing (most likely printed in late 1980) does. -- The series' North American editions have had numerous cover artists, with Bill Dodge the most recent. He was responsible for the Current 1998 - 2000 Random House Issues of numbers 1 - 11 and tended to draw the boys as very young, much younger than the text would indicate. -- Surprisingly, many of the nineteen Scholastic "small-size" Three Investigators books were still being printed in 1988, one year past Random House's end of the original series! -- For the first three books in the series, Alfred Hitchcock's face/head appears in the cover art of the Trade Hardcover and GLB editions. In the #1 The Secret of Terror Castle, his face is part of the bricks of the dungeon wall; in #2 The Mystery of the Stuttering Parrot, his head is a bust on the file cabinet in Headquarters; and in #3 The Mystery of the Whispering Mummy, his face is on the wall wearing the headgear of an Egyptian pharaoh. -- The cover art for the Scholastic paperback edition of #10 The Mystery of the Moaning Cave was by the original artist, Harry Kane, but it was not quite the original art. For this edition, the original work was updated with subtle style differences more appropriate for the 1970's. -- Random House's Find Your Fate series was not exclusive to The Three Investigators, featuring other genres and characters, such as fantasy stories with The Thundercats. Because of this, The Three Investigators' Find Your Fate titles are numbers 1, 2, 7 and 8. Numbers 3 - 6 exist, but do not revolve around The Three Investigators. -- As it was not nearly as popular as the original books, the Crimebusters series abruptly ended before the "forthcoming" twelfth title could even be published. This title is listed in later books as #12 Brain Wash. An additional thirteenth title written by G.H. Stone exists in manuscript form and would have been published as #13 High Strung. -- Although Random House's Revised Paperback Edition is not very popular with fans, its existence provides the only opportunity for collectors to have a complete, uniform, set of paperback Three Investigators books: Robert Adragna cover art, no internal illustrations and the keyhole design on the cover and spine. -- Both hardcover and paperback Three Investigators books can often be found with a remainder mark. This mark designates that the book did not sell at the published price; extra or defective stock of the book was remaindered to a wholesale dealer for discount sales. The mark is usually on the bottom edge of the textblock and is red or black stamp in the form of the publisher's symbol (in this case, the Random House "house") or simply a red marker line. -- Intended to be used and then discarded, The Three Investigators' Book of Mystery Puzzles is one of the most difficult titles to find, particularily without any writing inside. Available in paperback only and originally priced at $1.50, pristine examples can now cost more than $100.00. -- In 1983, a Random House promotional Three Investigators bookmark was available for free in libraries that carried the series. The bookmark featured Stephen Marchesi's cover art from #10 The Mystery of the Moaning Cave and had the phrase "I Love Mysteries!" on the front. The back listed all 36 paperback titles available at the time, with a noted price of $1.95. -- Of the first 28 hardcover titles, only five of the covers are artist signed. These are books #1 and numbers 17 - 20. Robert Adragna signed all of his covers. -- In the closing chapter of #5 The Mystery of Vanishing Treasure, Alfred Hitchcock states that, "The clues are all here. 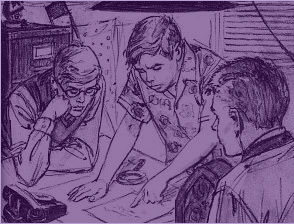 On page 18," indicating that the solution to the mystery lies on page 18 of the boys' notes. This is quite literal, as the solution is actually revealed on page 18 of the original editions of the book. On page 18, Jupiter discusses that the museum was air conditioned, and the Golden Belt ended up being hidden in an air conditioning duct! -- In 1971, Scholastic published its first Three Investigators books: #4 The Mystery of the Green Ghost in September and #1 The Secret of Terror Castle in November. Both were slightly smaller than their Random House hardcover counterparts, but had the exact same cover art and internal illustrations. In fact, the books used the same Random House typeface, but with one exception: both books had revised Hitchcock introductions to correct the chronological problem of Green Ghost being published before Terror Castle. -- M. V. (Mary Virginia) Carey wrote sixteen Three Investigators books, more than any of the other authors. Many of Carey's books deal with the paranormal and she is responsible for introducing the memorable characters of Professor Barrister and Allie Jamison, who both appear in two of her books. -- #24 The Mystery of Death Trap Mine is said to occur in the summer after #17 The Mystery of the Singing Serpent, but if each intervening book's time frame is calculated, Death Trap Mine actually has to occur about three years later. -- There was a glaring error in Random House's First Printing of the Trade Hardcover Edition of #2 The Mystery of the Stuttering Parrot: the title page simply stated "Illustrations by Ed Vebell." There was no reference to Harry Kane (the actual illustrator, Ed Vebell was the cover artist) or the author, Robert Arthur. -- In the 1970s and '80s, several Three Investigators books, in the GLB Edition, were part of the Random House Reading Progam. The books had a card pocket glued to a front or back endpaper that contained five cards, with questions and/or activities about the story, and two answer key cards. In school, each child would receive a copy of the book to read and then would have to complete the cards as an individual and/or group assignment. -- Blackbeard the parrot appears in four books: #2 The Mystery of the Stuttering Parrot, #3 The Mystery of the Whispering Mummy, #7 The Mystery of the Fiery Eye and #14 The Mystery of the Coughing Dragon. -- The entrances to Headquarters are Emergency One, Tunnel Two, Easy Three, Door Four, and possibly, Secret Four. Secret Four has never been fully explained and is only mentioned briefly in #5 The Mystery of the Vanishing Treasure. -- In 1984 and 1985, Random House only revised #1 The Secret of Terror Castle through #30 The Secret of Shark Reef. #31 The Mystery of the Scar-Faced Beggar, which actually introduced Hector Sebastian and #32 The Mystery of the Blazing Cliffs, which has a Sebastian introduction where he mentions knowing the boys "only briefly," were not changed, creating quite a continuity problem. -- In #30 The Secret of Shark Reef, The Three Investigators' client is John Crowe. This name is simply another of Dennis Lynd's pseudonyms that he occasionally used when writing adult mystery fiction.